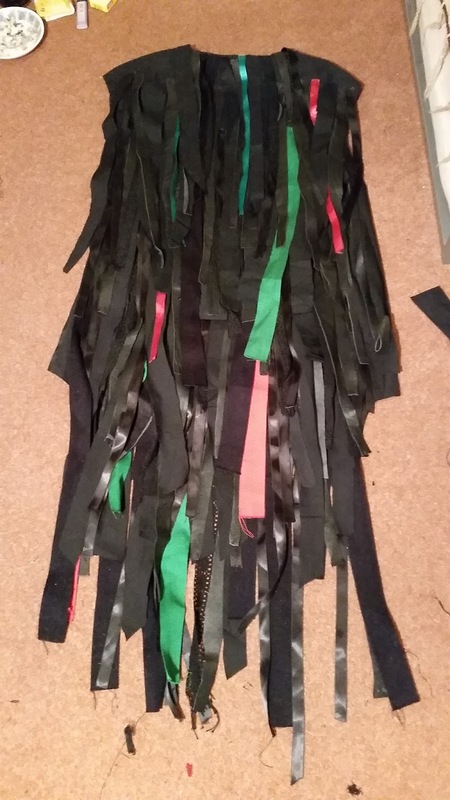 Breathing For Words: Making a Tattercoat! 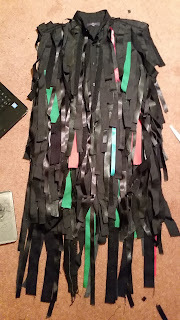 As you may know from some of my previous posts I am a Morris Dancer in a Border Morris side and that means that I get to wear a funky costume, even better, I get to make my funky costume! Morris Dancers traditionally wear tattercoats to signify the rags that traditional Morris dancers used to wear in years gone by. Traditionally Morris dancers were beggars and used to dance for money, those that danced along the English and Welsh border also used to black their faces with soot to avoid being prosecuted as begging used to be illegal, this is why the Border Morris sides of today now black their faces with face paint! 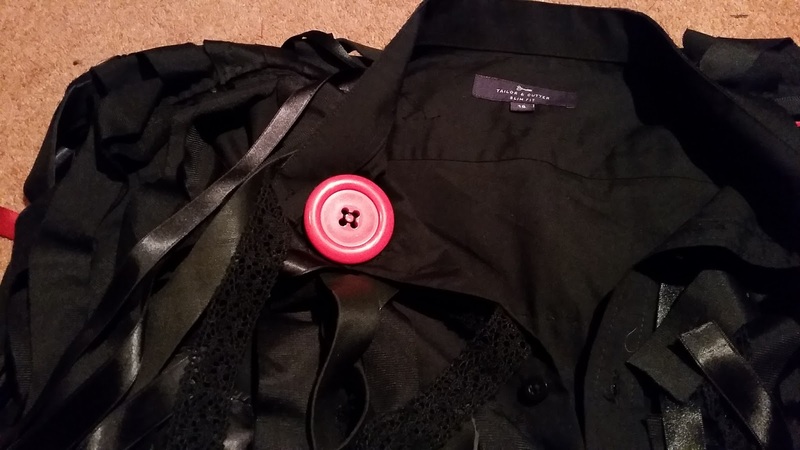 This post is all about how to make a tattercoat! First off I've got a big pile of tatters. 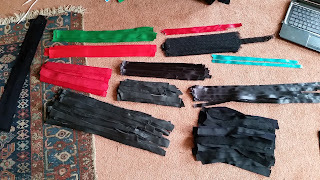 Mine are black red and green as these are the colours that my side wears, other sides wear all sorts of different colours and some don't wear tattercoats at all! 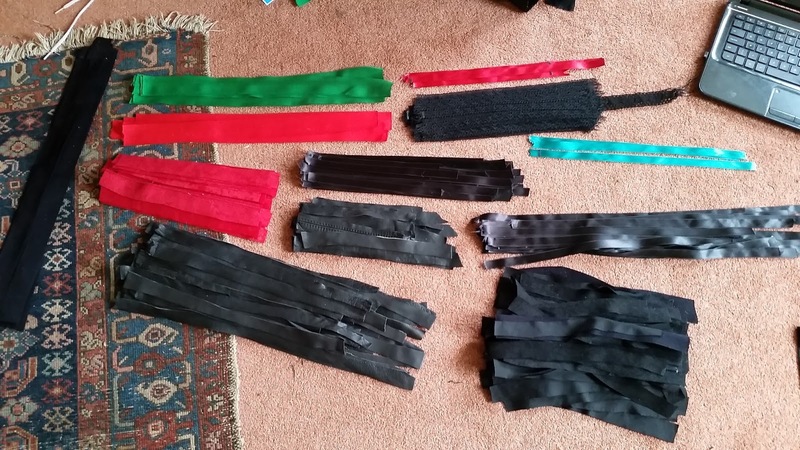 The tatters are all different shapes, sizes and materials so that the coat will look a lot more interesting! I've also picked up a large men's black shirt from a charity shop, this will form the basis of my coat. 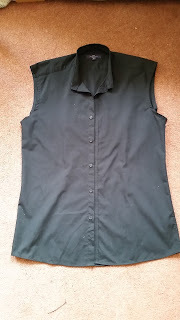 But before I start attaching the tatters I need to cut it into a less-shirt-like style. 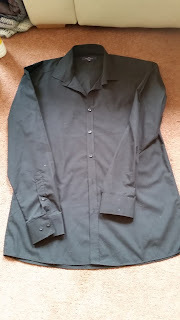 I've chosen to cut off the sleeves and the top of the collar and to keep the buttons at the front but you can do any variation on these things if you've got your own ideas or have seen another idea you particularly like. Many dancers do choose to keep the sleeves on, however as most of the major dance-outs are held in the summer I prefer to cut mine off so I don't get so hot on those sunny days. Next comes the fun part, attaching the tatters! Some people like to score or draw lines on their coats so that they know where to put the tatters but I prefer to just kind of wing it. 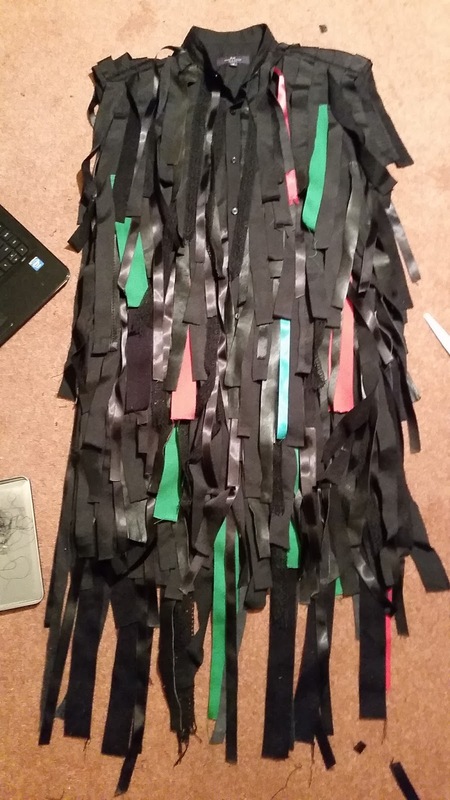 So I want to start with the back of the coat and at the bottom so I can work my way up easily (as the top tatters will lay over the bottom ones so doing it the other way around would be awkward and fiddly). 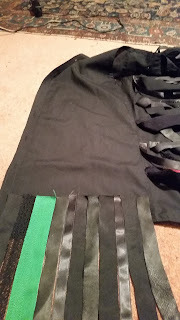 So I've placed my tatters and attached them with safety pins, now the best way to permanently attach them is to sew them on. 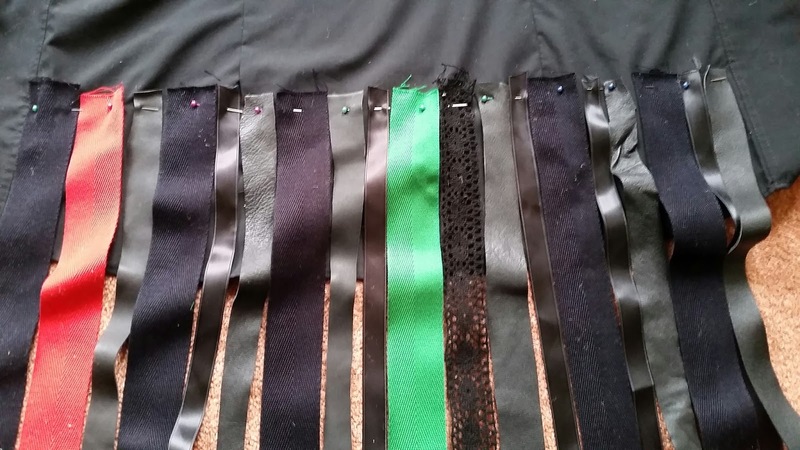 Some people just glue them, which is a lot quicker and easier (especially if you're like me and you don't have a sewing machine), but they come off a lot easier. I glued mine when I made my first coat last year and all summer I kept losing tatters everywhere I went, by the end of the year my coat looked pretty sorry. 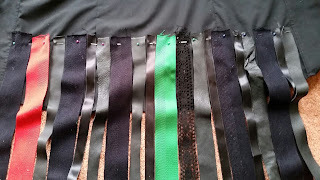 Work your way up the back of the coat adding row by row of tatters until you are happy with it. Then it should look something like this. Pointer - it is always difficult to get the tatters to lay well along the neckline, I suggest following the natural seams of the garment, and don't worry if it comes out looking a little messy, it is a tattercoat after all! I chose to do one side of the front at a time. Many dancers also attach the badges that they have got from attending dance outs to their coats. I hope you've found this helpful (or at least a bit interesting!). If you've used this tutorial to make your own tattercoat please do send me a pic, I'd love to see what you've done! And of course check out the side that I dance with! Styx of Stroud! 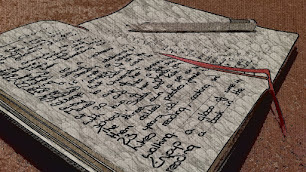 Motivational Monday - Seeking Short Stories!